Horsetail is one of the oldest plants on the earth, at least two hundred million years old. 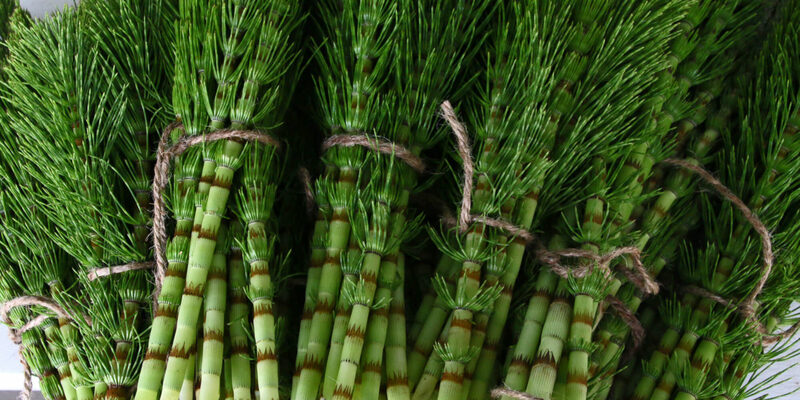 As an herbal remedy dating back to at least ancient Roman and Greek medicine, horsetail has been used by the body in the production and repair of bone, connective tissue, and skin. When it comes to aging, skin issues are at the top of the list of complaints.The importance of horsetail’s nutrients in healing, growth, and aesthetic appearance is what makes this remarkable plant such an important ingredient in NutriPlex Formulas’ ProMin supplement. Horsetail contains silica, an important mineral that helps promote strong bones and healthy skin, hair and nails. Connective tissue, including collagen, is what holds us together in so many ways, affecting the skin, bones, organ linings, blood vessels, cartilage, tendons, joints, and more. Without silica, these tissues lose their capacity to remain elastic and vital. Silica is used in the formation of glycosaminoglycans (GAG), which are the building blocks of connective tissues. One well-known GAG important for skin health is hyaluronic acid, which has gained great popularity among dermatologists and skin specialists who use it to promote skin cell proliferation and improve hydration. A deficiency in silica could lead to reduced skin elasticity and poor wound healing, because it is so tied to collagen and GAG formation. Collagen formation is essential for tight, wrinkle-free skin, which makes silica so beneficial for addressing the most notable symptom of aging — sagging skin and wrinkles. Many aging problems are a direct result of the body’s inability to maintain adequate collagen, with the most common ones being joint deterioration, fragile bones, hardening of arteries, dry skin, poor digestion, tooth and gum problems, and organs that diminish in strength and function. ProMin’s horsetail herb has been recognized by modern researchers and traditional healers alike as one of the most important sources of silica to support all connective tissues throughout the body.